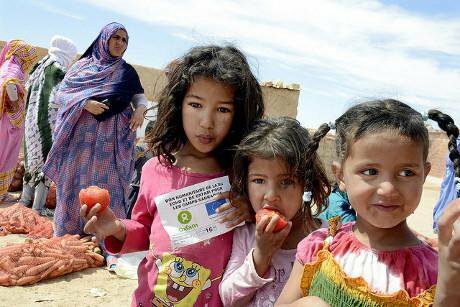 In lieu of a solution: Oxfam and the European Commission deliver humanitarian aid to the camps around Tindouf. Flickr / European Commission DG ECHO. Some rights reserved. “The biggest poverty that exists in the world is to lose your territory; we are not in our land and others are taking advantage of our wealth,” said Mahmoud Dellal, asked about the poverty in the refugee camps of Tindouf in Algeria, where he had spent more than 25 years of his life. He is one of the thousands of inhabitants of Western Sahara who had to leave the country 40 years ago, when it was occupied by Morocco. Dellal lived in a refugee camp until 2000, when he moved to Spain because his wife had health problems which could not be addressed by the precarious health service there. But he doesn’t feel Spain is his home—only the Sahara. “Any person feels fine where he comes from; when you live in exile you lose your dreams,” he said. He is convinced that “Sahrawis will never stop fighting for what is theirs”. The last colony in Africa, Western Sahara is divided by the second longest wall in the world (after the Great Wall of China). Located between the west of the desert and the Atlantic, it was assigned to Spain in the Berlin Conference of 1885, when the major European states distributed the African continent among themselves. In 1965, with the world immersed in a decolonisation movement, the United Nations asked Spain to do likewise (it was then called Spanish Sahara). Spain abandoned the territory but it did not let the Sahrawis express their self-determination right as the UN resolution had sought: it transferred control to Morocco and Mauritania in 1975, by means of a tripartite agreement, the Madrid Accords. When the agreement became effective, the Polisario Front, born in 1973 to fight the Spanish coloniser, waged war against Morocco and Mauritania, proclaimed the Sahrawi Arab Democratic Republic (SADR) and created refugees camps in Algeria to host Sahrawis who escaped persecution by the occupying armies. In 1979 Mauritania withdrew but Morocco (with the support of France and the United States) continued the war against Polisario (supported by Algeria). Hostilities were prolonged until 1991, when the parties agreed a ceasefire overseen by the UN, which organised a mission (MINURSO) to monitor the situation and organise a referendum on Sahrawi self-determination. But the referendum never took place, due to irreconcilable differences between the parties as to who had the right to vote. The UN continued renewing the MINURSO mandate annually, without any progress. Nowadays, Western Sahara is the unique non-self-governing territory in Africa. The UN never recognised the Madrid Accords, because the arrangement “did not transfer sovereignty over the territory, nor did it confer upon any of the signatories the status of an administering Power”. Nor has the International Court of Justice recognised Moroccan sovereignty. Therefore, according to international law, Spain remains the ‘administering power’, and decolonisation should end with the application of “the principle of self-determination through the free and genuine expression of the will of the people of this territory”. Nevertheless, any solution to the conflict seems remote. The parties have very distant positions and the international community does not press them to achieve a solution. “Unless an unforeseen event will occur, this problem will not be solved because nobody wants it to be resolved,” said a Spanish expert on the Maghreb, Tomás Bárbulo. In the documentary Hijos de las Nubes the former French foreign minister Roland Dumas said that “no solution is the solution”. But what is really making this conflict irresolvable? Polisario, recognised by the UN as the representative of the people of Western Sahara, is determined to get a referendum on self-determination. International law supports this, so the front is immovable. “We are not asking for anything strange—it is written in all UN resolutions and in the International Court of Justice,” said Mohamed Yumani, a member of Polisario and president of the Saharan Immigrant Association in Aragon (Spain). On the other side, Morocco has always claimed—despite the UN’s contradiction—to have held sovereignty over Western Sahara before the Spanish colonisation and it attaches complete validity to the Madrid Accords, as “duly registered at the UN’s Secretariat General”. It accuses Polisario of blocking negotiations and having a “biased” understanding of self-determination, which it says need not necessarily be exercised through referendum—although this was already what the UN had called for in 1966. Morocco proposed an autonomy plan in 2007 but it is not in hurry to find a solution. The Moroccan government feels comfortable with the status quo, which allows it to control and act as de facto administrator of most of the territory. Western Sahara is divided from north to south by a sand wall of 2,700km—further than from Madrid to Copenhagen—built by Morocco during the 80s. Nowadays, the Alaouite kingdom controls everything west of the barrier, including all the habitable territory and the natural resources. Phosphates and fisheries and (possibly) offshore oil and gas make Western Sahara one of the richest parts of the Maghreb. The BuCraa mine in the north contains one of the biggest reserves of phosphates in the world and, according to Western Sahara Resources Watch, generated the equivalent of $330m for Morocco last year. The EU is negotiating a fisheries agreement with Morocco for access to Western Sahara’s waters, worth €40m per year. East of the wall, the area controlled by Polisario, there is only desert inhabited by some nomadic tribes. In the area occupied by Morocco, 70,000 natives mix with 150,000 Moroccan settlers, while there are some 165,000 refugees in the camps in Algeria and a further-scattered Sahrawi diaspora. Mohamed Yumani, who spent two decades in a camp, said that “life there is extremely difficult”. Sandstorms are common and the temperature reaches 50C in summer. The camps, controlled by Polisario, are completely dependent on international aid, which has been reduced since the onset of the economic crisis. Gonzalo Moure, a Spanish aid worker who has visited several times, has seen evidence of child malnutrition. Yet Dellal envisages being back in Tindouf when his wife recovers. Rabat has invested in Western Sahara—indeed its development and social services are superior to Morocco proper. But freedom is denied to those who favour independence or even a referendum. The UN secretary general, Ban Ki-moon, echoed complaints of abuses of civil and political rights in his last Western Sahara report—“particularly in the form of arrests without warrants, cruel, inhuman and degrading treatment in detention, confessions extracted under torture or violation of the right to a fair trial”. But the international community remains inert. “Western countries are interested in the Moroccan occupation because it provides iron control in a region that is a space of jihadist activity,” said Bárbulo. Their governments are applying Realpolitik, prioritising geopolitical and economic interests over international law and human rights. Stephen Zunes, Middle East expert at the University of San Francisco, said in Hijos de las Nubes that the US “is unfortunately quite willing to sacrifice fundamental principles of international law in the name of supporting a strategic ally”. In his book about Western Sahara, Zunes asserts that France and the US have not only provided Morocco with material support but have dominated the approach by the United Nations Security Council (UNSC) to the conflict, avoiding condemnation of the occupation. In 2013, during the debate on the annual renewal of MINURSO, the US proposed monitoring human-rights violations in Western Sahara but, due to Moroccan pressures, this was left out of the final resolution. In November that year, the king, Mohammed VI, visited the US president, Barack Obama, and the White House declared Morocco’s autonomy plan “serious, realistic, and credible”. Morocco has also invested roughly $20m since 2007 in “lobbying policymakers and soliciting sympathetic coverage from journalists in the United States”, according to an article published in Foreign Policy last February. Among Western countries, Spain has an added responsibility as the de jure administering power. It acts, however, like the others: it doesn’t defend Moroccan occupation openly but its inaction supports it. A report that sets the basis of Spanish foreign policy for the next years says that an independent Western Sahara would be “non-homogeneous”, with inhabitants “susceptible to radicalisation”. Is any solution possible? Juan Domingo Torrejón, researcher in international relations at the University of Cadiz, points out that Chapter VII of United Nations Charter allows the Security Council to press ahead without the agreement of the parties. Yet the substantive gulf remains: “A solution based on the strict application of the self-determination right would be totally contrary to Moroccan interests, and France would veto it in the UNSC, but I neither see it possible to impose a formula favourable to Morocco without asking the population, because it would raise serious legal questions.” Torrejón also warned that “a favourable solution for any of the parties could cause instability in the Maghreb”. Last April, the MINURSO mandate was extended for one year more without any relevant change. In August, the Canadian Kim Bolduc was supposed to replace Wolfgang Weisbrod-Weber as head of MINURSO but at time of writing she had not been able to travel to her post—Morocco was apparently displeased that it had not been consulted about the appointment. For Torrejón the stagnation can be also dangerous because the situation may deteriorate further: “There is not a solution on the table, the humanitarian conditions in the refugees camps are getting worse and tension between the parts in the territory controlled by Morocco has increased.” Meanwhile, said Bárbulo, young people in the camps wanted to go to war because they had seen how their parents lived “and they don’t want to live like them”. Joining a war without prospect of victory makes no sense but the perspective is different in the camps: the emotions play a bigger role there and refugees have lost faith in the international community. “Young people don’t want to bear more and, even if we don’t arrive until the end, at least we will teach something to Morocco,” said Yumani.